Nokia 700 also known as Zeta, a leaked handset by Nokia is now out in the open giving its first official shots for the press. However there is no official spec list or any other detail of the device. By the looks of the images and earlier leaked specs, the device will have a 3.2 inch AMOLED capacitive touch screen, a 1GHz processor, a large speaker grill at the bottom, a 5MP camera a front camera, NFC, and probably a new update of the Symbian Anna platform called Belle. Nokia is finally getting into the game and launching handsets with 1GHz processors. New Symbian devices with 1GHz processors, including the Zeta, are said to be official by September, which means that Symbian Belle will be out at the same time. And what about Windows Phone then ? 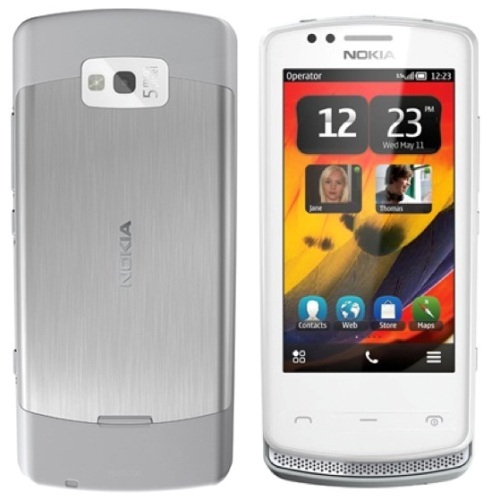 How will Nokia market both Windows and Symbian handsets side by side ?